In either case, the active ingredient is carbamide peroxide or hydrogen peroxide. The bleaching agent penetrates the outer layer of the tooth i.e. the enamel and removes the stains and improves the shade of the tooth. The ‘At-Home’ tooth bleaching products can be available in the form of whitening gels, pens, strips or even whitening toothpaste. In the chair-side method, we use professional tooth whitening kits and devices to achieve the optimum shade of the tooth. A fully trained and qualified Malo Smile USA dentist performs the ‘In-Office’ type of tooth bleaching. 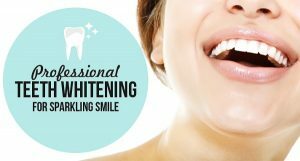 Teeth whitening can be contraindicated in some clinical situations, and our dentist is the best person to diagnose and let you know if you’re a suitable candidate for tooth bleaching. The over-the-counter tooth whitening products used at home mostly come with a universal tray that may not fit well in your mouth and any procedural errors may later lead to side-effects like the sensitivity of teeth, gingival irritation, and others. The concentration of the bleaching agents is greater in the products used in the chair-side method as compared to the over-the-counter whitening products and other ‘At-Home’ variants. Moreover, laser therapy or application of heat is done in the chair-side method. This technique assists in achieving quick and effective results. Is teeth whitening at the dentist’s office cost-effective? Although the cost of the chair-side tooth whitening procedure is more than the ‘At-Home’ products, they give quicker results, and also the chances of procedural error are minimized. After the visit to our office and the initial diagnosis, we can recommend and advise you on the correct treatment according to your individual circumstances and financial options. We may also prescribe you a bleaching gel along with a custom tray as the ‘At-Home’ tooth bleaching option. The biggest benefit of tooth whitening is that a person who hides his teeth while smiling starts laughing out loud; the latter ultimately boosting the self-esteem of the person. The overall quality of life is improved. Also, as the discoloration due to aging process can be reversed by this technique, this can give you a young and dynamic look. In today’s world of selfies, each one of us wants a perfect picture. So, what are you waiting for? Smile freely by getting your teeth bleached.